Mothers’ Day is almost here, can we tempt you with a lovely Korean BBQ dinner with your mum? 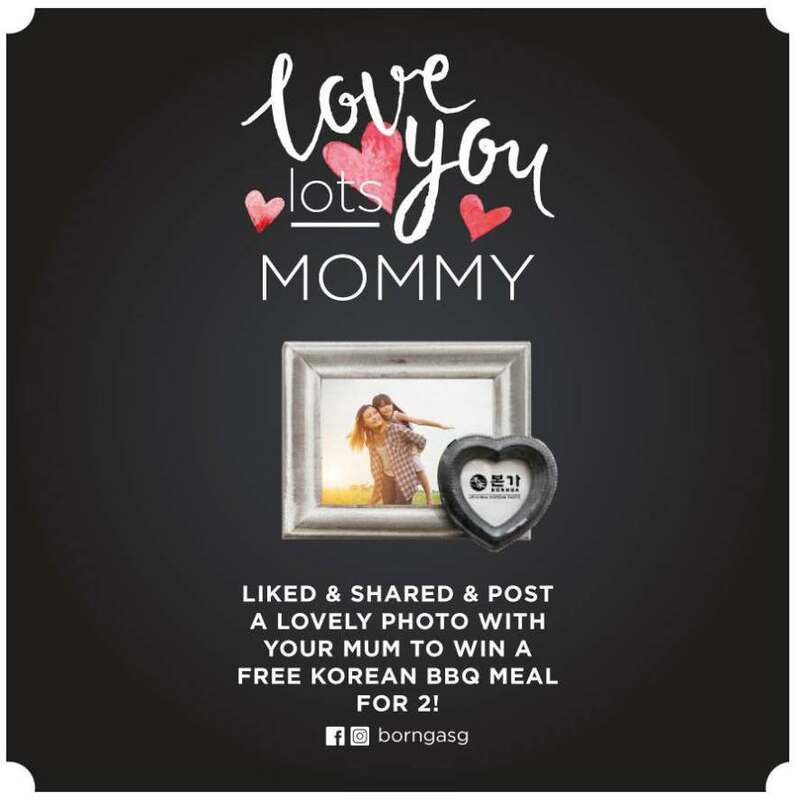 LIKED & SHARED & POST A LOVELY PHOTO WITH YOUR MUM TO WIN A FREE KOREAN BBQ MEAL FOR 2! − Lastly, also tag your lovely Mom or any of your friends to participate in this contest. We will select 3 lovely winners by 7 may 2017, 11.59pm. Find out more at Bornga Singapore. 1. The “Bornga Mothers’ Day 2017” giveaway is open to all participants residing in Singapore. 2. winners will be selected at the end of this giveaway and announced via Bornga Singapore’s Facebook post on 8 May 2017, Monday. 3. Winners will need to provide their Name, Contact Details (mobile number/email address) and NRIC number via a Facebook message to Bornga Singapore’s Facebook page within 2 days of the announcement. 4. Winners who do not contact Bornga Singapore within 3 days after the announcement post regarding prize collection, or who do not claim the prize within the stipulated collection time frame, will have their prize forfeited. 5. 3 winners will each receive a BBQ set meal worth $91. The meal is only redeemable in Star Vista Restaurant, during weekdays and by 31 May 2017 and prior phone reservation is required. Please furnish the restaurant that you are the winner of the Mothers’ Day 2017 campaign and your details. 6. Bornga Singapore has the right to substitute the prizes with items of similar value at any time without prior notice.